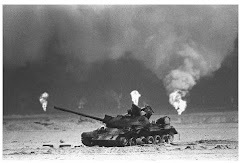 The story below regarding Dr. Jim Baraniuk's latest Gulf War Illness medical research findings is the latest in a growing body of findings aimed at developing treatments to help the quarter million veterans of the 1991 Gulf War -- more than one in three -- suffering from Gulf War Illness. To date, VA has failed to develop a single proven effective treatment for Gulf War Illness, which VA does not even believe is a unique condition, instead lumping the toxin-generated neurological disease in with every other "chronic multisymptom illness". This is just the latest in VA's foot-dragging for Gulf War veterans, who have a 20-year history of VA mistaking motion for progress. Last June, the Congressionally chartered VA advisory panel responsible for overseeing the federal government's Gulf War Illness research efforts and judging them based on a treatment standard blasted VA with a unanimous finding of "no confidence in the ability or demonstrated intention of VA staff to formulate and execute an effective VA Gulf War illness research program.” VA has yet to fix the many serious issues identified in this report, including the whitewashing of this first ever Gulf war Illness Strategic Plan that VA staff even took GWI out of the plan's title. Instead of fixing these serious issues, VA Secretary Shinseki instead signed a VA-staff generated revision to the RAC's charter retaliating rather than fixing these serious issues. The revisions include an array of changes that include removing entire paragraphs requiring all VA treatment focus in VA medical research and any intention of improving Gulf War veterans' health and lives, fire the RAC Chairman (with a "transition" period) and half the RAC staff (this year, the other half as soon as next year), put new caps on the budget, remove the requirement that the RAC has its own independent staff, and much more. Thankfully, Gulf War veterans' many friends in Congress continue to fund the Gulf War Illness CDMRP, far outside where staff at the broken U.S. Department of Veterans Affairs (VA) can do any damage. Meanwhile, instead of addressing Gulf War veterans' concerns, VA instead issues press releases spinning as if they're doing a great job for Gulf War veterans while failing to respond to concerns raised. One would think that VA leadership might want to at least start to play catch-up with the GWI CDMRP, which is finding real answers to the unique, toxin-induced neurological disease that is Gulf War Illness. VA can and must do much better. In the meantime, Gulf War veterans can count on talented non-VA researchers like Dr. Jim Baraniuk using non-VA funding to help improve the health and lives of the quarter million Gulf War veterans suffering from Gulf War Illness. I look at research and policies that affect our soldiers. One of the greatest tolls on a veteran with Gulf War Illness is the crippling but mysterious fatigue that can strike unpredictably and is exacerbated after physical exercise. It is often at the root of the condition, which is described by theDepartment of Veterans Affairs as a “chronic multisymptom disease.” Patients also commonly report joint and muscle pain, irritable bowel syndrome and respiratory disorders. Researchers at Georgetown University Medical Center, who frequently heard complaints about fatigue, suspected the symptom might be related to dysfunction in the central nervous system. But making such a determination has not been easy; though cases of Gulf War Illness are now 20 years old, the science of the disease has not evolved as rapidly as one might expect given that it affects an estimated 250,000 veterans who deployed to the Gulf War. Scientists still don’t understand why or how patients become ill. So the researchers at Georgetown designed a study to test how the brains of sick veterans responded to exercise, the results of which were published Friday in PLOS ONE. What they discovered surprised the team, said lead researcher Rakib Rayhan. They subjected 10 healthy controls and 28 veterans with Gulf War Illness to a series of exercise and memory challenges, measuring the blood flow to their brains before and after physical exertion with a functional magnetic resonance imaging scan. First, they found that veterans had distinct responses to the exercise challenges, which were two bicycle stress tests. One group of 10 subjects had abnormally rapid heartbeats — a clinical condition known as orthostatic tachycardia – while the remaining veterans experienced a significant increase in pain sensitivity. Meanwhile, the control group exhibited none of these differences. In both subgroups, the evidence suggested dysfunction in the central nervous system. Something was amiss in the way the veterans’ bodies handled physical exertion, but the researchers didn’t know why. The fMRI scans, though, held important clues. For the group with rapid heartbeats, imaging showed atrophy of the brain stem, which regulates heart rate. And in the subjects with increased soreness and discomfort, the researchers saw grey matter atrophy in adjacent regions of the brain associated with pain perception. Before the exercise, the veterans’ brains in both groups showed increased activity while trying to complete a memory test as compared to the controls. Rayhan described this as a kind of compensation. “The brain is realizing there’s damage somewhere and something else takes over,” he said, likening the extra activity to a crutch. Yet after exercise, the difference was shocking. When veterans in the group with increased pain took the test, their brains appeared blank, and both groups lost the compensatory activity. “You’re taking the crutch away from them by doing this exercise,” said Rayhan, adding that it might explain why veterans with Gulf War Illness feel cognitively exhausted and generally fatigued after physical exertion. Rayhan is careful to note that the study isn’t a “linchpin” for the science of Gulf War Illness. One of the study’s limitations is its inability to demonstrate whether the brain atrophy is a result of a decades-old injury or exposure to wartime hazards like nerve agents, oil fires or pesticides. It may, for example, be the brain’s response to chronic pain. Yet, Rayhan hopes that both VA and civilian physicians take his team’s research into consideration when treating a veteran with Gulf War Illness. Another recent study by Rayhan and his collaborators found that changes in the brain may be linked to the disease. These initial results are promising to veterans, many of whom have complained for years that doctors attribute their disease to war-related stress or a psychological disorder, and prescribe medication or treatments that don’t alleviate their symptoms. Ronald Brown, 45, has encountered this attitude from some VA doctors, though he speaks highly of his current physician. Brown, who is considered 100 percent disabled by VA, has been diagnosed with numerous maladies – chronic fatigue syndrome, respiratory disease, fibromyalgia, migraines, sinusitis, irritable bowel syndrome and post-traumatic stress disorder – in the years since serving as an Army soldier in Desert Shield/Desert Storm from August 1990 through April 1991. He now lives in Roanoke, Va., and participated in the Georgetown study so that it might help scientists and veterans like himself better understand Gulf War Illness. 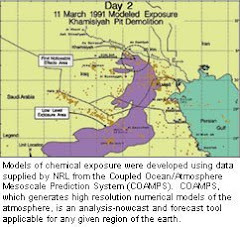 Brown suspects that his disease may be related to exposure to chemical warfare agents in Khamisiyah, Iraq in March 1991, an incident that the Department of Defense has documented. Brown says he suddenly experienced profuse sweating, headaches and nausea during this period. When he returned home the next month, he was unable to perform well on physical endurance tests, and began noticing symptoms that would plague him for the next two decades. Yet, Brown is less interested in how he developed Gulf War Illness than in making a better recovery. That’s something Rayhan believes is possible if the Georgetown studies are successfully replicated and scientists can identify currently available drugs that effectively treat central nervous system disorders, or develop new medications based on that research. Rayhan is also cautious about dangling new research before a group of patients desperate for help.